Who is this Witchy Woman? OZ, The Great and Powerful is the upcoming film directed by Sam Raimi. Inspired by L. Frank Baum's 1900 novel The Wonderful Wizard of Oz, the story works as a prequel to both the novel and the 1939 movie. This is NOT Wicked, the musical as a movie but that is coming in the next year or so too. If it was Wicked, I'm betting on Anne Hathaway to be Elphaba, especially if she is as brilliant in the Les Miserables movie musical as the trailer indicates. The studio released the first trailer back in July, now they're set to release a series of posters featuring the three witches. 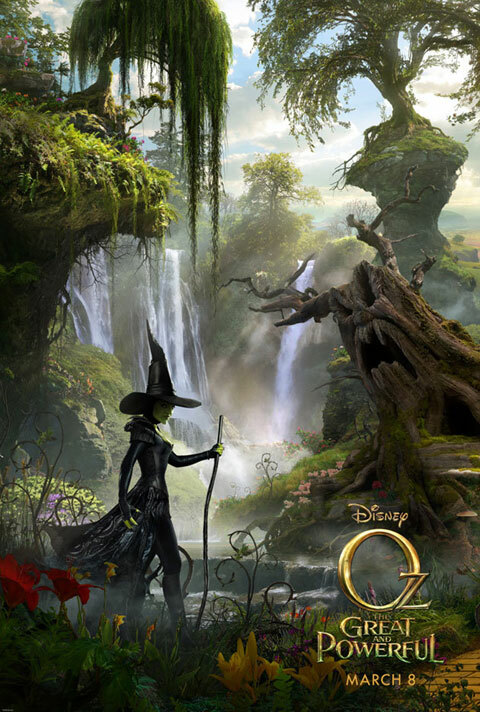 The question is, who is this witch in the OZ, The Great and Powerful poster? It's not Michelle Williams. She plays our gloriously good witch, Glinda. One look and you know this witch ain't good. It's the sexually suggestive blacky rubbery wardrobe that makes that clear. The film also stars Mila Kunis as Theodora and Rachel Weisz as Evanora. The witch in this new poster must be one of them but which one? The Wicked Witch of the West or the Wicked Witch of the East? This is the first of three new posters being released and featuring the witches. Maybe when the others are released we'll know which sister this is. In the meantime, I'm betting on Rachel Weisz as the Wicked Witch of the East. And where is poor James Franco's poster? He is Oscar Diggs, the great and powerful "Wizard of Oz"... I guess that's what you get for blowing the Oscar gig - just kidding! The film will be released in March 2013, in traditional 2D, as well as in 3D. I didn't know there was a new version of Oz coming out soon. Shhh, but I don't think I've ever seen the original, or read the book. Hadn't heard this was on the way. Looks great!